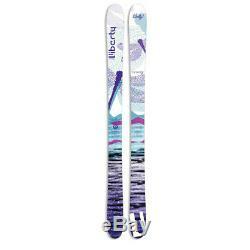 Liberty Genesis 96 2017 2018 Women's All Mountain Skis NEW. The Liberty Genesis 96 2017/18 is an energetic playful ski with all the right equipment to ski the whole mountain. Made to accommodate all conditions the Genesis 96 is a capable ski, and a great choice for the intermediate skier looking to improve across the board. Built with Bomb rocker the Genesis will go in and out of turns thanks to the aggressive rocker, and camber underfoot. A bamboo core provides a pleasantly light and energetic feel throughout the ski, while still retaining some dampness at higher speeds. The liberty Genesis is a great choice for those looking for a one ski quiver. Top-sheet: Brand new, no issues Base: Brand new, no issues Edges: Brand new, no issues Binding: No Binding included. Side-cut 151 cm: 130-96-117 165 cm: 130-96-118 171 cm: 130-96-118 Turn Radius 151 cm: 13 m 165 cm: 15 m 171 cm: 16.5 m. Ski at your own risk. About Utah Ski Gear: Utah Ski Gear was established in 2011 and We believe that Skiing is for everyone. Helping our customers find the right equipment to get them and their family skiing is our passion. We understand price can be the biggest deterrent, because of this we offer new and used skis on a budget. For the more experienced skier looking for advanced gear we offer hard to find accessories like specialized tuning equipment, and high performance skis. Customers preferring maximum comfort while skiing can find electric boot heaters, such as Hotronic FootWarmers. This listing is for multiple identical products. Stock Photos have been used for this listing, but all skis have been inspected and are in like new condition. Listed by Josh at Utah Ski Gear. The item "Liberty Genesis 96 2017 2018 Women's All Mountain Skis NEW" is in sale since Saturday, January 12, 2019. This item is in the category "Sporting Goods\Winter Sports\Downhill Skiing\Skis". The seller is "utahskigear" and is located in Sandy, Utah. This item can be shipped worldwide.